It’s spring here where I live and everything is turning green. There are flowers everywhere and the weather is perfect. Friends are starting to invite us to picnics and I like to bring something yummy for these informal get-togethers. Usually ‘hand food’ is ideal, anything that can be easily eaten without silverware or even plates. And of course the kids like to grab goodies to munch on while they’re running about the yard. So today I am sharing a recipe I came upon ages ago, I don’t quite remember where. I tweaked it to my preferences and fell in love with it. The recipe is so easy to make that I think it may just be fool proof! 1. Heat your oven to 350 F.
2. In a food processor bowl combine all of the base ingredients except the butter and yoghurt. Mix well. Add the cold butter and the yoghurt and pulse until the mixture becomes a course crumb. Be careful not to mix too much as you still want some lumps of butter to make your shortbread a nice texture. 3. Place two cups of the mixture into a small bowl and set aside. 4. Press the rest of the mixture into the bottom of a (15 1/2 inch X 10 1/2 inch) baking pan and bake for 8 minutes. Set aside. 5. In a saucepan on medium heat mix all of the filling ingredients. Heat stirring once in a while until the mixture thickens to a jam like consistency. This should take about 15 minutes. 6. 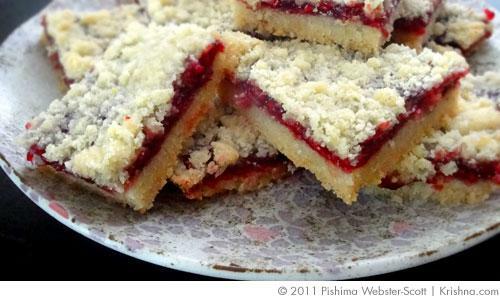 Spread the jam over the baked shortbread. 7. Sprinkle the set aside crumb mixture on top of the jam. 8. Bake until golden, about 20 minutes. Cool before eating. Like I mentioned before, it is quite easy to make these, but sometimes thing happen, so if you try to make these and they don’t turn out delicious, please let me know.